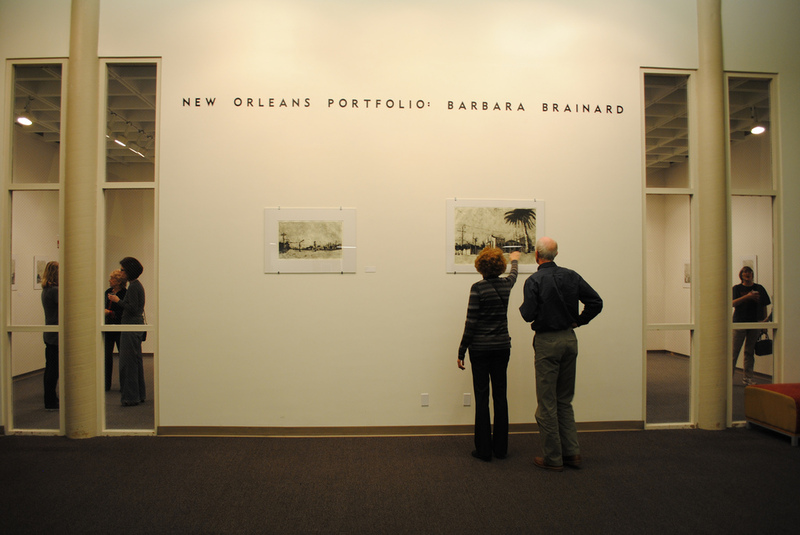 Haunting visual works of the tragic and rich region of New Orleans are now featured at the Anita S. Wooten Gallery at Valencia College's East Campus. 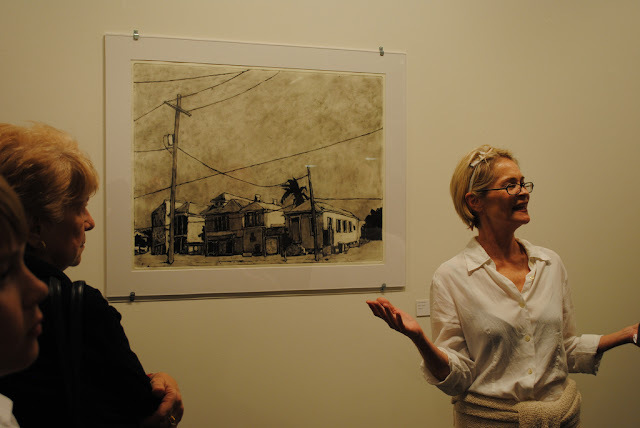 Artist Barbara Brainard attended the opening night of her exhibit to talk about what inspired her artwork, and also answered questions from those in attendance. “There has been a lot of interest in exactly what they are looking at, because the city is so diverse and complicated geographically,” said Brainard. 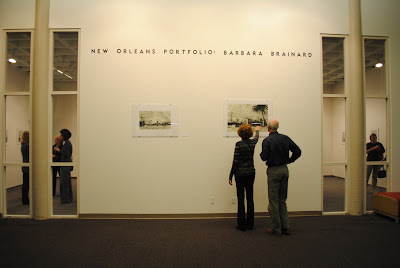 A resident of New Orleans for 30 years, Brainard was inspired by the paintings of abstract impressionist Richard Diebenkorn, and her post grad-school work with mono-type artwork. 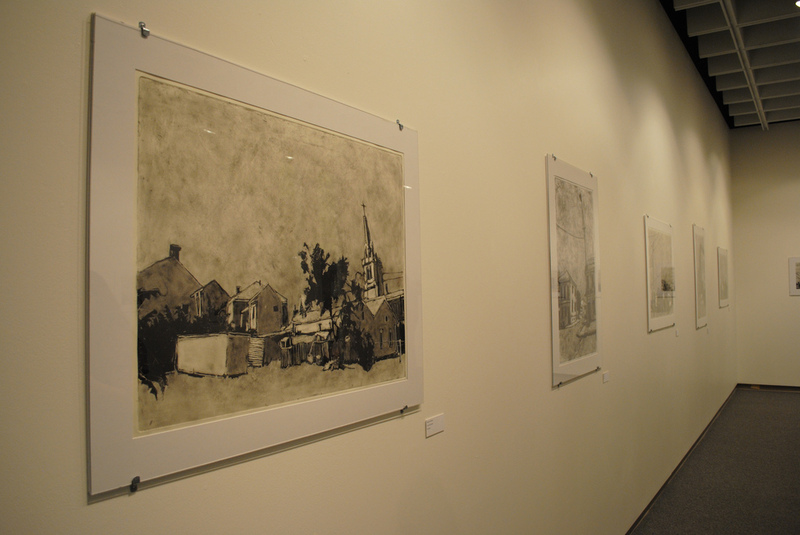 The artwork featured in the gallery are mono-types which are created by etching ink on a plate which is then transferred onto paper over the plate with a press. It’s a style that has been around for over 370 years and has a damp and aged look with a random outcome. Some of the works featured were only recently finished by the artist and sent to this display directly from her studio. Close examination of the artwork will show several details with an overall foggy and somber feel. In a city surrounded and often equated with water, an impression is given of the damage done -- the city is now a ghost of its former self. Brainard spoke about most of the pieces describing the sights, sounds, and smells of each location. Brief history lessons were also given, mostly involving once great or sadly still unrecovered landscapes, with a strong focus on the architecture of iconic buildings, and with back stories that you wouldn't normally note from the misty images. “It’s very unique work, and it’s so good to have it explained in detail,” said Samuel Ramos, a second year art student. He, along with over 50 others, were in attendance to hear Brainard go into extended details during her presentation. A lot of the details of post-Katrina New Orleans are genuinely unsettling and hard for outsiders to fully understand. Seven years later some of the scars still haven’t healed, and the city continues to rot as areas continue to fall into disorder. “It’s a gritty city and this style works really well with that; it let’s the images swirl,” said Karen Cowden, professor of reading at Valencia. Being tied to such an interesting city, this exhibit provides a diverse opportunity for students and the general public to be reminded of the story of New Orleans, and how this can teach lessons for the future.